Developing ideas into actions for a new ACT Housing Strategy. The ACT Government is committed to putting housing first, because we believe that a home binds together the fundamentals of living. A good secure home is central to so many parts of life – school, work, good health, friendships, comfort, security and happiness. The release of the ACT Housing Strategy brings together contributions from housing experts, housing tenants, service practitioners, and the community, and is the most comprehensive roadmap to future housing and support service needs ever developed for the ACT. The ACT Housing Strategy is now available online at the Homes and Housing website. the Housing and Homelessness Summit. almost 200 stakeholders participating in the Summit. The new Housing Strategy builds on the conversations that were started with the community in 2016. It's a multi-layered approach with a large range of responses and initiatives and has been informed by community, key stakeholders, and subject matter experts with experience in the many complex policy issues. The Engagement Summary Report contains the different ideas and contributions, and demonstrates the complexity of the challenges facing the ACT, and the diverse range of participants involved in the consultation process. The ACT Government has used the ideas included in the Report in the development of the ACT Housing Strategy. We've developed a Housing Strategy that commits the government to 74 actions across five key goals spanning the entire housing continuum, from homelessness services through to private home rental and purchase, and puts a long term framework in place for greater fairness and equity in the housing market. The ACT Housing Strategy is available online at the Homes and Housing website. The implementation of the Strategy will be ongoing and the website will be updated as individual actions are progressed. In addition, the Homes and Housing website will provide information about actions and accessing public, community and affordable housing. Access to appropriate and affordable housing options is a nationwide issue. In the ACT, low to moderate income households who earn less than $100,000 annually are particularly at risk of homelessness or are experiencing housing stress. Housing stress is where a household is paying more than 30 per cent of household income on rent or mortgage payments. the 1,700 people experiencing homelessness – this includes people living in supported accommodation, staying in temporary accommodation, in severely crowded living arrangements or are sleeping rough. the 7,000 households in the private rental market who are paying more than 30 per cent of their income on rent and are at a high risk of experiencing homelessness. Approximately 11,500 households are living in either public or community housing. housing options for older women, Aboriginal and Torres Strait Islander communities and women and children escaping domestic and family violence and people with disability. boosting the supply of private rental and home purchase opportunities for all low to moderate income earners. The task at hand is considerable and should not be seen as one that the Government must tackle alone. We need to work together as a community to find new and better ways to address these issues, and think about how we can work together to leverage the combined efforts of government, industry and the social sector. 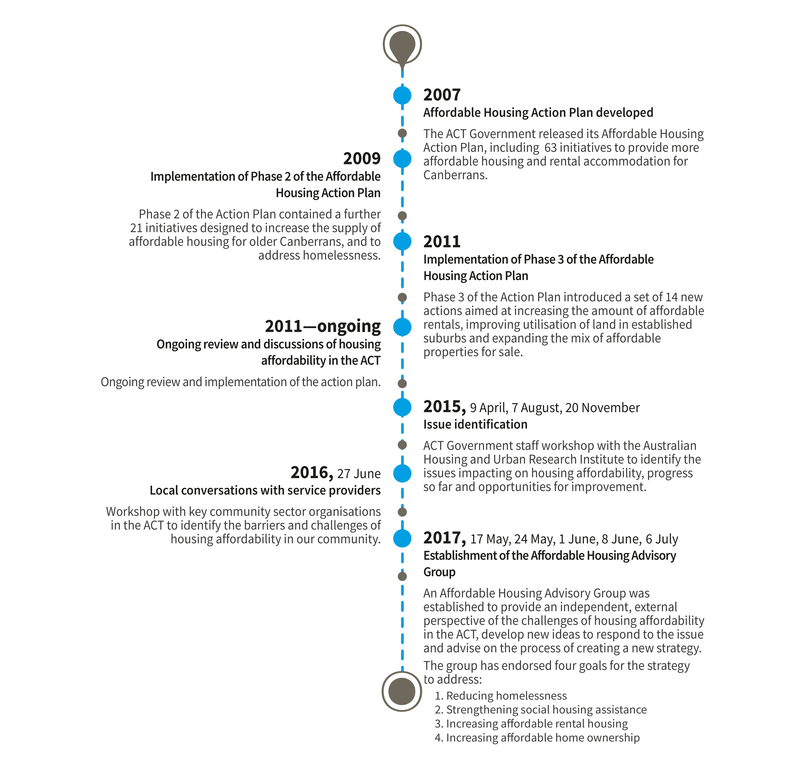 In 2007 the ACT Government released the first Affordable Housing Action Plan, which included 63 initiatives to provide more affordable housing and rental accommodation in Canberra. The strategy had broad targets from addressing homelessness through to building a pipeline of new land supply. Read the 2011 Progress Report on the Affordable Housing Action Plan here. Ongoing reviews of the action plan identified a need for a sharper focus specifically on households earning less than $100,000 a year. Members also played an active role in ongoing wider community consultations in the lead up to the ACT Housing and Homelessness Summit in October 2017. 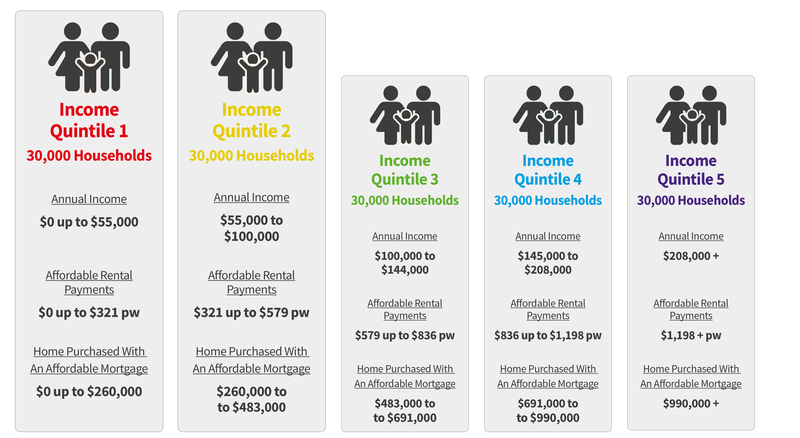 The ACT’s 150,000 households are divided into income quintiles. This strategy will focus on the first two quintiles. This discussion paper seeks to set the scene and provide background information on affordable housing in the ACT. Check out what we heard during consultation from stakeholders and community members. The first stage of consultation to develop the Housing Strategy opens. Participate online, through a drop-in session or writing a submission. All feedback from the first stage of engagement is collated and analysed into possible actions for the Housing Strategy, which are then taken to attendees at the Housing and Homelessness Summit in October 2017. A Housing and Homelessness Summit will bring together stakeholders from the affordable housing sector including government, not-for-profit housing associations, community service providers and industry. Participants will be invited to discuss and refine draft strategies for the Housing Strategy, based on the feedback from phase 1 community engagement.